Just Married, a Norman Rockwell painting , appeared on the cover of The Saturday Evening Post published June 29, 1957. This is another timeless favorite of Rockwell collectors, a classic for all the ages. An alternate title for this painting is After The Honeymoon. This painting was Rockwell's 296th overall out of 322 total paintings that were published on the cover of the Saturday Evening Post. Rockwell's career with the Post spanned 47 years, from his first cover illustration, Boy With Baby Carriage in 1916 to his last, Portrait of John F. Kennedy, in 1963. This was also the third cover for The Post in 1957. In 1957, there were five Norman Rockwell Saturday Evening Post covers published. The original oil on canvas painting, 33 x 31 inches or 84 x 78.5 cm, is part of the collection of the Columbus Meseum of Art. on page 213 of Norman Rockwell, A Definitive Catalogue by Laurie Norton Moffatt. Two studies also appear in the Norman Rockwell Catalogue on page 214. Two photographs used to produce the painting, one with Rockwell himself, are reproduced in Norman Rockwell: Behind the Camera by Ron Schick on page 194. Norman Rockwell got just what he wanted out of these two models. One of the photographs taken during the staging of this painting shows Rockwell standing in for the lady on the right with the pose and expression he wanted her to portray. And that is the pose she showed and the pose he painted. Certainly cleaning personnel are somewhat used to finding odds and ends during the course of their jobs. All manner of personal items get left behind in hotels and motels. The kind of personal items these ladies have found today are not run of themill. The have found and, no doubt, swept up this nice pile of confetti. It was the custom of the day in the 1950's to throw confetti at the bride and groom instead of rice. Not only is that better for the planet, but that custom does not waste food either. So these ladies, in the course of their duties, have found a fair amount of confetti. Once they found the "Just Married" banner and the old shoe that been tied to the back of the car, they no longer had to wonder about the origin of the confetti. The confetti had somehow found its way into the clothing of the bride and groom, and probably into their underclothing as well. Was it these two lovers from The Marriage License? 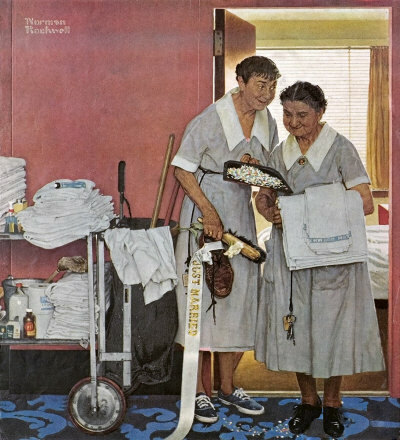 Just Married was only one of 322 Norman Rockwell Saturday Evening Post covers; Here is the list of Norman Rockwell Saturday Evening Post cover illustrations. Now these ladies have something to giggle about. The leftovers from the honeymoon have made these cleaning ladies' day. Monday just got better for these two. Do You Have A Great Story, Opinion Or Contribution About Just Married?